A bathroom remodel project can be one of the most surprisingly fun projects homeowners take on. Reinvigorating the style of a home’s bathroom can transform it from a place that is loathed to a destination for relaxation and refreshment. ProSource® of Charlotte offers quality products for the best bathroom renovation results. 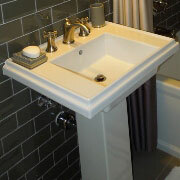 At ProSource® of Charlotte, your sink selection can be as traditional or unique of a style as you prefer. You may start with a style like pedestal, vessel, or shroud and then select your shape, material and color. 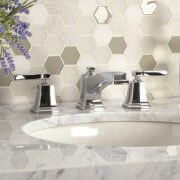 The possibilities are endless with our wide selection of bathroom sinks from popular manufacturers. Faucet options from ProSource Wholesale® can suit all bathroom designs, from classic to modern and traditional to contemporary. Choose from a wide selection of handle types, material types, and price ranges to fit your specific project budget. A shower should be a place that is inviting, comfortable, and functional. There are many different options to choose from with a new shower, but our expert team is here to help you choose which is best for you or your client’s needs. Storage is often limited in the bathroom because it is normally a cozier space than the rest of the home, which makes the vanity a very valuable aspect of a bathroom. Vanities include everything from the storage and counter space to mirrors, lights, and more. At ProSource of Charlotte, our experts can help you find the right vanity for you. There is a plethora of options for bathtub designs. 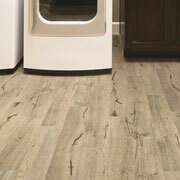 With a range of styles that come in fiberglass, porcelain, marble, stone, and more, there are endless possibilities. Our showroom makes it easy for contractors and their clients to quickly dive into the multitude of options to decide on the best tub for your bathroom renovation project. You will be in awe at the number of toilets you may choose from at ProSource® of Charlotte. From those with eco-friendly flush ratings to an unusual flush mechanism, you can find the perfect throne to upgrade your bathroom. We proudly serve Charlotte, North Carolina, and the surrounding areas. The ProSource of Charlotte showroom is conveniently located in Charlotte, North Carolina and serves all of the neighboring cities including Albemarle, Alexis, Ansonville, Badin, Barium Springs, Belmont, Bessemer City, Blacksburg, Boiling Springs, Boomer, Bowling Green, Candor, Casar, Catawba, Charlotte, Cherryville, Chester, Chesterfield, China Grove, Claremont, Cleveland, Clover, Concord, Connelly Springs, Conover, Cordova, Cornelius, Cramerton, Crouse, Dallas, Davidson, Denver, Earl, East Spencer, Edgemoor, Faith, Fallston, Fort Lawn, Fort Mill, Gastonia, Gold Hill, Granite Falls, Granite Quarry, Grover, Harmony, Harrisburg, Hickory, Hickory Grove, Hiddenite, High Shoals, Hildebran, Hudson, Huntersville, Icard, Indian Trail, Iron Station, Kannapolis, Kings Mountain, Lancaster, Landis, Lando, Lattimore, Lawndale, Lilesville, Lincolnton, Locust, Lowell, Maiden, Marshville, Matthews, Mc Adenville, Mc Connells, Mc Farlan, Midland, Mineral Springs, Misenheimer, Monroe, Mooresville, Moravian Falls, Morven, Mount Croghan, Mount Gilead, Mount Holly, Mount Mourne, Mount Pleasant, Mount Ulla, New London, Newell, Newton, North Wilkesboro, Norwood, Oakboro, Olin, Pageland, Paw Creek, Peachland, Pineville, Polkton, Polkville, Rhodhiss, Richburg, Richfield, Rock Hill, Rockingham, Rockwell, Ruby, Rutherford College, Salisbury, Scotts, Sharon, Shelby, Sherrills Ford, Smyrna, Spencer, Stanfield, Stanley, Statesville, Stony Point, Taylorsville, Terrell, Troutman, Troy, Turnersburg, Union Grove, Valdese, Vale, Van Wyck, Waco, Wadesboro, Waxhaw, Wilkesboro, Wingate, Woodleaf and York.